Proper tile and grout cleaning is challenging for the average person, and many do not understand just how much special care is required. For this reason, many people turn to The Grout Medic for cleaning grout and tile regrouting. Our service experts possess the knowledge and skill needed to clean, maintain, seal, repair or even replace tile or grout. Mopping your floors can keep tile and grout surfaces clean, but it is not a powerful enough method to remove all the grime that settles over time. 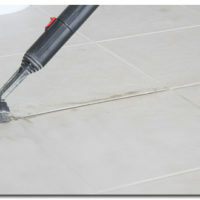 Unclean water or poor mopping can actually stain grout faster, as dirt and mud is pushed into the pores of the grout. If you are going to mop, consider using a wet vac to make sure all the moisture is eliminated. Avoid the risk of causing discoloration while cleaning grout by having it professionally cleaned by The Grout Medic. 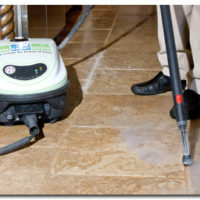 We use a steam-cleaning system that penetrates the pores of your grout to get the material truly clean. You may make a dent in the dirt with enough elbow grease. However, rough, vigorous scrubbing can remove much more than grime. Stiff or wire brushes wear away and dislodge grout, while also scratching the top of the tile. Don’t waste time and energy scrubbing grout and tile. Call The Grout Medic and have your grout cleaned quickly. Find your local Grout Medic and get a free estimate on your services. Or call 1-866-994-7688, and a member of our customer service crew will assist you.